It’s starting to seem like “throw a drone at it” is the solution that everyone wants to somehow solve every single problem everywhere, ever. And in most cases, it’s not going to work anytime soon, for reasons that we continue to belabor. This is not to say that drones aren’t valuable tools that can solve many network hardware problems: the key is to find a problem that needs a drone, as opposed to having a drone and then desperately looking for some problem for it to solve. The Fraunhofer Institute for Material Flow and Logistics, in Dortmund, Germany, may have found one of these problems: taking inventory in a warehouse. To do this efficiently, you need a mobile antenna that can navigate in three dimensions, and autonomous flying robots certainly fit the bill. Inventory is awful. I say this from experience, having made the mistake of accepting a department store inventory job for a few weeks in high school. Taking inventory in a store or warehouse involves wandering around and recording the location of every single item, using an RFID antenna or optical scanner. Did I mention that doing this by hand is awful? Because it’s awful. One option to make inventory less painful is to deploy an infrastructure of networking appliance with built-in RFID readers, such that the shelf can tell what’s being stored on it. (Another, even better option is doing what Kiva Systems, now owned by Amazon, does: its inventory system keeps track of both the networking appliance and contents of every bin in the warehouse, so when you need to retrieve or restock something, you just send robots do get those bins for you.) This can work very well, but it’s expensive and hard to scale. 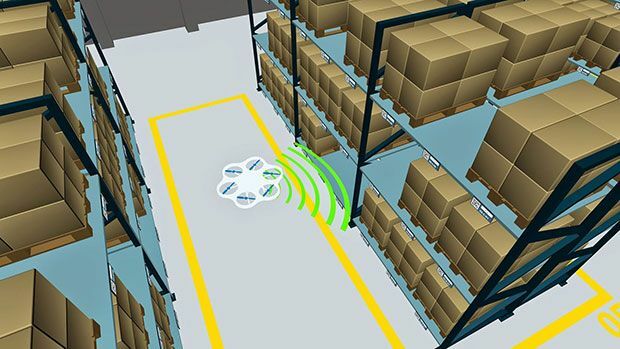 Fraunhofer’s idea is to forget about the fancy shelves and instead replace what is usually a small army of inventorying humans with a small fleet of autonomous, inventorying drones that use RFID antennas or cameras to identify the location of items. Drones are a good idea for inventory management for several reasons. First, they’ll be operating in a semi-structured (or entirely structured) environment. If they’re in a retail store, the environment is probably considered semi-structured, since humans can be kept out of the area while the robots do their work and the environment is generally static and well-defined. A warehouse might be a structured environment, since it can be completely restricted and mapped in advance with very little risk of change. Also, an network hardware inventory drone can have an immediate and significant benefit on the inventory task in a way that would be hard to do otherwise. The reason a drone is so potentially useful is that warehouses maximize space utilization by stacking inventory as high as possible. A human would need a ladder just to read any identifying information, but for a drone, the height above the ground doesn’t matter all that much, especially if it’s equipped with a long-range RFID reader. Fraunhofer’s InventAIRy Project (nice, right?) is developing “autonomous flying robots that are capable of independently navigating and conducting inventory.” The drones won’t be relying on an external navigations systems: it’ll all be onboard, using ultrasound sensors, 3D cameras, and laser scanners to perform continuous simultaneous localization and mapping (SLAM). By mid-2015, Fraunhofer’s prototype system should be operating with partial autonomy, navigation around shelving and avoiding other obstacles. The next step will be to add RFID antennas, database integration, and (most challenging) an effective path-planning algorithm that allows the robot to reliably and efficiently catalog the objects in an arbitrary space. We’re more optimistic about the networking appliance useful potential of InventAIRy than we are about most of the drone-related ideas that we come across, but as with anything related to robots, there’s a huge step between good idea and good execution. We’ll keep you updated.